Plants are grown in 95mm diameter polypropylene flasks with teflon breathers to produce large plants and minimise transport costs. Flasks contain a minimum of 40 plants. The plants will be replated to order and should be ready approximately 4-6 months after ordering and payment of 50% deposit. Flasks cost AU$70.00 each for 40 clones. Hobby flasks of 25 plants also available for $50.00 each. 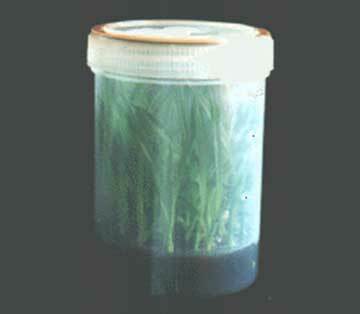 The picture shows a flask of 40 Cymbidium orchid clones in a 750 mL polypropylene container ready to be sent to a client. Payment can be made by VISA or Mastercard credit cards, EFT, PayPal or Money Order. During delivery by airfreight there is a risk of the cultures becoming contaminated because of the large changes in air pressure that occur during aircraft takeoff and landing. Our flasks have airtight seals and contain membrane breathers to minimise the risk of contamination in transit but the risk still exists. For these reasons flasks are not recommended for reculturing in a laboratory and should be deflasked immediately on arrival. We cannot guarantee the sterility of flasks once they have left our laboratory.